The basics of making Valentines are actually pretty simple, but as you get more creative you can make some really beautiful pieces of artwork. Like any type of homemade card you can stay as simple as you want or you can get really creative. This is for a heart-shaped Valentine, but you can use any shape of base for your Valentines. They can be like a regular card, like a postcard and much more. Cut a heart out of the red construction paper slightly bigger than the size of the doily. The easiest way to cut out a uniform heart is to fold the construction paper in half and draw half a heart with the ends on the folded side. You can fold one doily in half and use it as a template to draw a slightly larger heart of the same shape on the paper. Cut out the half heart and unfold. Next glue the doily to one side of the heart. Now you can decorate your Valentine in any way you want. You can put a heart-shaped sticker in the center of the doily heart, or you can use the blank space in the doily to write your Valentines message. 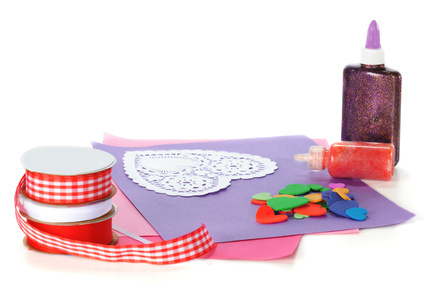 If you want to make even more creative valentines, you can make Valentines with flaps that fold up with messages inside, or pop-up cards and much more. Another fun trick is to cut out images from old valentines cards and use them on your new homemade valentine.